Rob is a 1985 graduate of Pacific University’s Physical Therapy program. He moved to Baker City in 1996 where he established Baker Valley Physical Therapy. He is especially proud of the exceptional provider and clinic staff team assembled at BVPT. Rob has volunteered his services over the past 20 years for Baker High School athletic programs and has hosted and presented Speed and Agility Training and ACL Injury Prevention clinics to local high school athletes. 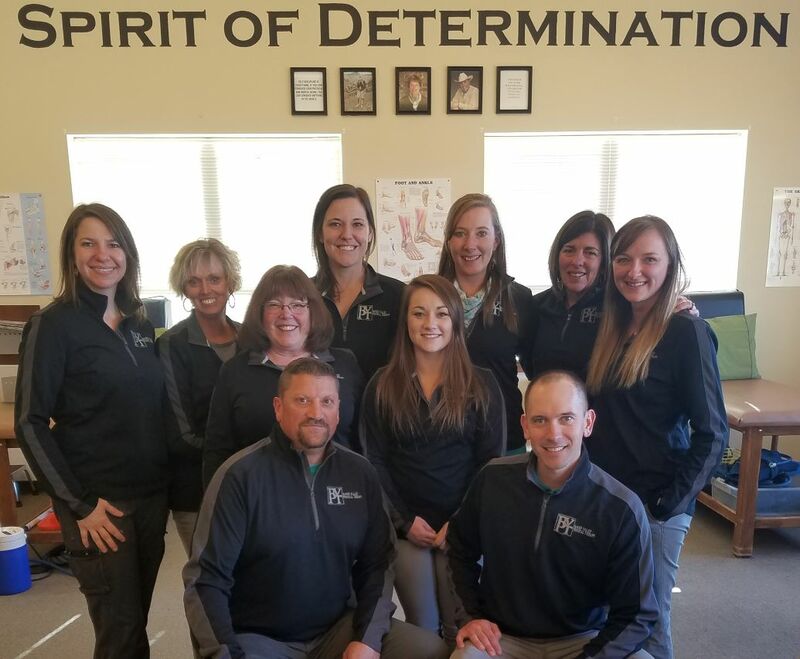 Rob believes that one of the most satisfying aspects of being a physical therapist is seeing patients and athletes return to or exceed their previous level of activity. Rob is an active member of the Baker City Knights of Columbus and Baker Quarter Club. In his time outside of the clinic, Rob enjoys working on home projects, spending time outdoors, playing golf, traveling and spending quality time with his wife and 4 children. After being raised in Lincoln City, Oregon, Blake Marlia continued his education at Pacific University in Forest Grove, Oregon. He received a Bachelors of Science in 1998, and then went on to receive his Doctorate in Physical Therapy in 2001. Blake has been employed with Baker Valley Physical Therapy since 2001, and enjoys seeing diverse patient populations. Blake enjoys running activities inside and outside of the clinic. He has a passion for trail running and competes in trail running competitions around the area. Blake loves to be outdoors, and loves exploring the mountains in Eastern Oregon. He is also an active member of the Baker City Lions Club. Above everything else, he loves the time spent with his wife, Dana, and two kids, Paige and Landon. Jodi Flanagan received her Bachelors of Science in Exercise Science in 1996 and her Masters of Physical Therapy in 1998 from the College of St. Catherine in Minneapolis, Minnesota. She then Made the move to Baker City to start her career at the local hospital. Jodi also spent two years volunteering in Eastern Oregon University’s athletic training department until the birth of her first child in 2000. In 2002 (After the birth of her second child), Jodi made the move to Redmond, Oregon, and worked for Therapeutic Associates before returning “home” to Baker City. She joined the team at Baker Valley Physical Therapy after the birth of her third (and final) child in 2006, and has been there here ever since. Jodi loves spending time with her family: sitting in bleachers watching their events, camping, and traveling (most especially to Disneyland!). When she is not working, coaching track, or watching her children's events you can find her working outside or reading. Sally graduated from the Physical Therapist Assistant program at Mount Hood Community College in 1989. She has provided Aquatic Therapy services for Baker Valley Physical Therapy since its inception in 1996 at the local YMCA pool and, following its opening in 2008, the BVPT in-house aquatic therapy pool. Sally was exposed to aquatics at an early age as a competitive swimmer, has worked as a lifeguard and swim instructor and coached competitively at the age-group and high school levels. She feels fortunate to have the opportunity to combine her love of aquatics with her PTA background to provide aquatic rehabilitation services to patients of all ages. She has particular interests in providing aquatic therapy for her pediatric patient population. When not in the clinic, Sally enjoys her excessive number of pets, walking, reading, traveling and spending quality time with her family. Kristina is a residency- and fellowship- trained physical therapist and board-certified Sports Clinical Specialist. She graduated from the MGH Institute of Health Professions in Boston, MA and went on to complete her Sports Physical Therapy residency at Massachusetts General Hospital and Northeastern University. Prior to her move to Baker City, she held faculty positions within the MGH Sports/Northeastern University Residency program and at Northeastern University. She also most recently held a position in Jackson Hole, WY, where she treated a high volume of traumatic sports related orthopedic injuries. Kristina was selected to join the Fall of 2016 class of the Kevin Wilk Traveling Fellowship specializing in non-operative and post-operative athletic rehabilitation. Her clinical practice now consists of recreational and competitive athletes of all ages, with a primary focus on the biomechanical assessment and post operative management of the lower extremity. As a native of Baker City, Kristina enjoys spending time in the outdoors hiking and camping. She also enjoys home renovation projects and spending time with her family.